Everyone knows that the McDowalls (and especially the Nicolas half) almost never go away for holidays and so forth as other folk do . . . so, if they do actually get on the move, it is quite a event. The fact is that Frances spent time in Florence as a student and one of our most happy times was a week there, decades ago and we have always wanted to go back. To go very early or very late in the year is a must for us from the point of view of heat and tourists so, when we happened upon the description of a little flat with the above view out of its bedroom window which happened to be vacant for the first two weeks in March, we made a number of decisions very quickly. We are now returned for a week and, having things more or less back to normal, I turn here and wonder what I can possibly put into a post. First to say that the logistics were wonderfully straightforward and we had an entirely enjoyable time. The flat (‘fourth floor – no lift’, as the description warned) was very comfortable and was situated in the Santa Croce district which is not only where the furniture makers and picture-framers work but it seems to be where the models for sundry apostles, executioners, angels and so on employed in all the frescoes by the master painters of the C13 onwards still live! We found ourselves happily situated with regard to the basics . . . with Florence’s second largest (and much nicer) market, the Sant’Ambrogio just round one corner and a supermarket round another! 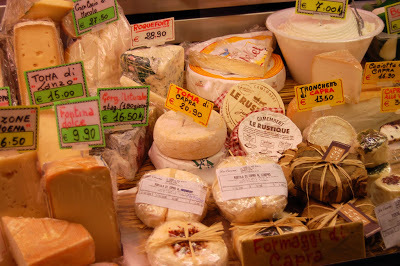 As this photo shows, we decided to work our way through the range of goat’s cheese offered on this stall. We did not have the equipment for great cookery but just to picnic in one’s own place is so much more fun (for me, anyway) than so much eating out. I also got great pleasure from ‘putting the rubbish out’ on the way to the Uffizi! I am NOT going to bore with descriptions of the things everyone knows about. I will just stick to three highlights – all the more remarkable for being unexpected by us. 1. Rodolfo Siviero was born in 1911 and died in 1983. He was an art specialist but during the Second World War he was in the Resistance concentrating particularly on preventing the Nazis from ‘acquiring’ or destroying works of art. 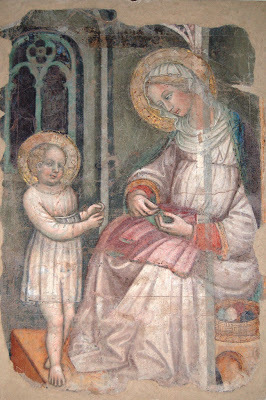 After the war he concentrated too on the restoration of such works to their rightful owners. 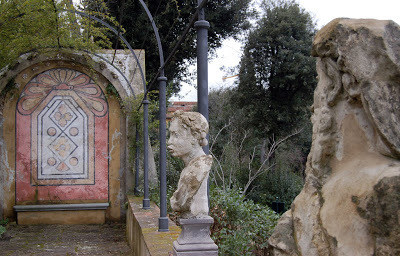 For many years he lived in the small Poggi palace, on the ‘other’ bank of the Arno and it is here, in the Casa Siviero, that his own collection of beautiful objects from the Tuscan region has, for a number of years now, been displayed. We simply found ourselves walking past it but were instantly captivated. As you can see from this picture (which I should not have taken, I am afraid) you can see the delicious randomness of the things placed in this joyous cupboard. They are not great, breathtaking objects and they are often incomplete or broken in some way but they each effortlessly demonstrate that they are ‘good’. An entirely delightful look round, as it were, at things collected and loved over the years by an obviously lovely man. The day we found the museum happened to be the opening of an exhibition of sculpture and painting by an artist called Lucy Jochamowitz. Fascinating stuff but especially because her work had been placed around the rooms in the gallery, rubbing shoulders with the permanent exhibits. 2. Again we found this ‘by mistake’. 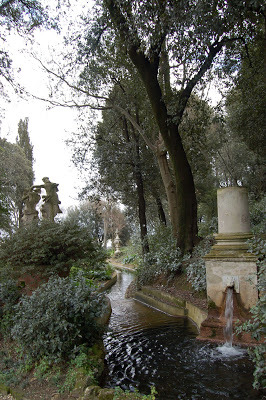 We were on our way to explore the Boboli Gardens – behind the Pitti Palace, when we found ourselves at the entrance to something called The Bardini Gardens. The Guide books (at least the older ones) said nothing about this but we slowly pieced together the face that these gardens, which rise steeply away from the Ponte Vecchio as it were, again on the ‘other’ side of the river, are of considerable age but for a great time have been available to no one and overgrow. 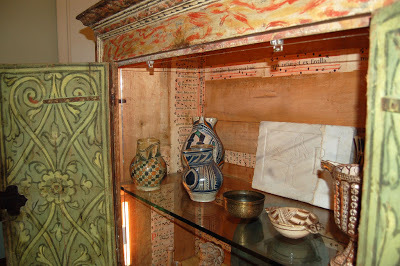 Very recently they have been wonderfully restored by some particular bank and are just open to the public. The fact that were so early in the year mattered not at all for a high proportion of these lovely spaces relied on the beauty of evergreen trees and shrubs and, where roses were going to bloom later, we still had sculpture to delight in. One Japanese party whizzed past, as if on a bullet train, but, for the rest, we had the entire garden to ourselves. I hope these photos give a taste. 3. I was taken completely by surprise by one particular object of which we had not heard before. 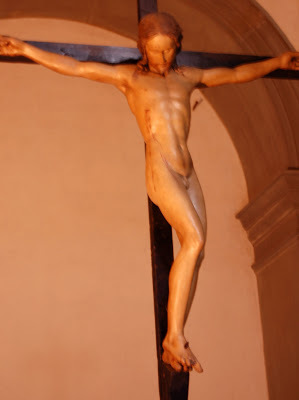 Apparently, Michelangelo carved this crucifix in wood as a gift to a bishop or a cardinal or whatever for allowing him to study human anatomy . . . something like that. It was then lost and was rediscovered a short time ago in a storeroom at Santo Spirito. It is possible, I have to say, that this history is erroneous and the cross is now only attributed to the artist. Anyway, we heard about this and the fact that you have to ring a bell for a sacristan in the Basilica of Santo Spirito who takes you into a side chapel and there, suspended over the altar in sublime silence and on the end of a immensely long cord from the roof is this sublime object. There was almost no light there and flash was (rightly) forbidden so I was greatly relieved that at least some of the long exposures I make were not too shaky and indeed have more feeling than the ‘official’ postcards. I could talk about why I find this object so beautiful and so powerful but I would rather hope that any readers who have not seen it for themselves might just spend a moment with it here. OK 4. One of the things we saw which I found most immediate and therefore moving, was this. It may not look very impressive beside the great frescoes, but . . . Apparently this was found during the restorations after the flood of 1966. 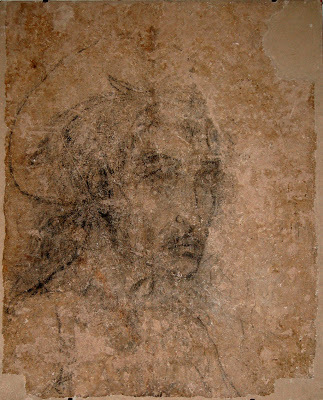 Plaster was removed from a wall and this head of a saint (about 5-6 feet tall as I remember) was revealed exactly as it had been drawn with charcoal direct on the wall as the first thought of whichever artist it happened to be . . . who then he pushed off for a glass of wine perhaps and, for whatever reason, the work went no further. Magic, I thought. Talking of the floods. One can see little lines drawn on buildings to show the levels and some of the old photos are amazing. Here, though, is a good indication. 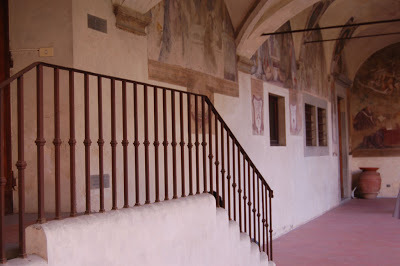 This cloister is just back from the Arno and its floor is about level with the river bank. On the left of the photo, on the wall behind the railings are two little plaques. The lower one indicates the flood level in 1888 or whenever it was but the one at the top is that for 1966. We did think this was rather sweet – with the little one helping with Mummy’s threads. Is it just this side of mediaeval kitsch? Oh, all right! On our final evening, I was able to get this remarkable shot – by doing it at precisely the right moment. Sorry the moon is not in focus as well as the Duomo but the exposure seemed to go on for half the night as it was! I don’t know how we could top all that, frankly, so I am quite happy to revert to non-holiday mode. Frances talks, however, about going to India . 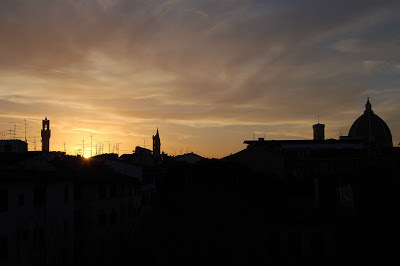 . .
Lovely to read your news of Florence, and to share some of the city’s treasures in your photographs. I can almost smell those artisan cheeses and the sunlight on ancient plaster! You’ve both been working so hard, that the break must have done you a power of good. I’ve never visited Florence, and so thank you for this experience by proxy! Much appreciated. Nicolas and Frances, what a coincidence! We were probably in Italy at the same time, maybe even in the same airport. I’ve just come back from a few days in Rome to visit my sister and niece & children. My report and movie are on Blaugustine. Wish I could have had time to meet you in Florence – one of my favourite cities in the world (or at least it was, many years ago when I was last there. Perhaps when Frances was?) 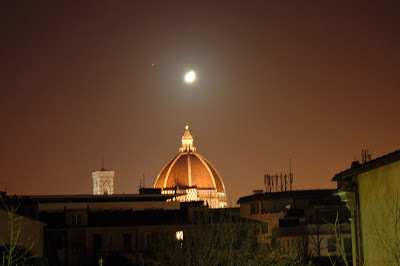 How lucky you stayed near Piazza Santa Croce, a fabulous place. All your photos and descriptions are gems.